That didn’t take long. 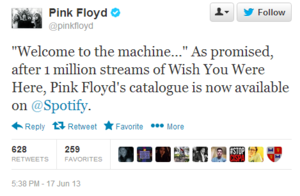 Four days after Spotify promised to bring the Pink Floyd discography to its music service if—and only if—the classic track “Wish You Were Here” was streamed one million times, the company announced Monday that the milestone was shattered. All the Pink Floyd tunes you could ever want are now available to soothe your savage breast over on play.spotify.com or via the Spotify desktop application. Well, sort of. Purists will quickly note that the digital discography consists of remastered versions of the original tunes, but to be fair, diehard Floyd fans probably weren’t holding out for Spotify streaming to get their psychedelic fix. It’s also worth mentioning that the Spotify discography rocks the regular “Discovery” editions of Pink Floyd’s remastered albums, rather than the beefed-up “Immersion” and “Experience” editions that were released in recent years. Even so, it’s hard to complain. Pink Floyd is on Spotify! 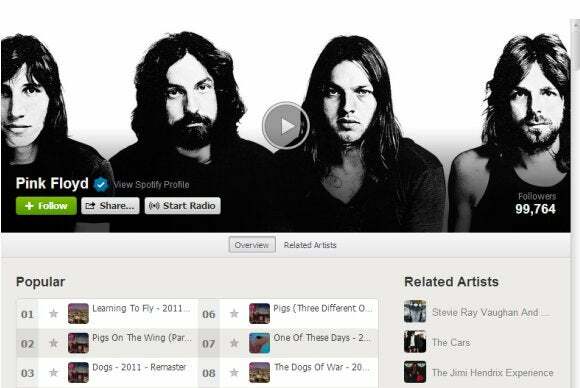 The Pink Floyd addition comes mere months after Metallica, another longtime Spotify holdout, landed on the streaming-music service. Only a few big-name bands are left refusing to cross the digital divide, most notably AC/DC, The Beatles, and Led Zeppelin. 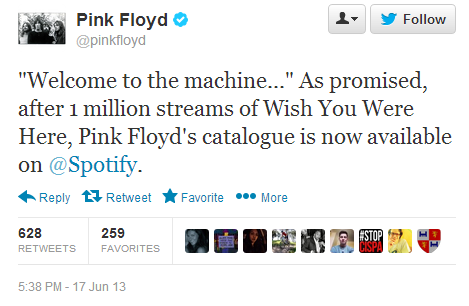 On second thought, you might just want to stick with Pink Floyd. The playlist (above left) should get your week off to a beautiful sonic start.